As you use natural gas, your meter measures how much gas is flowing. We are committed to provide regular maintenance to them and keep your bill accurate. Nothing is more important than your safety. 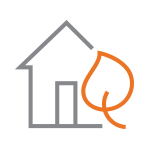 So, if you ever smell natural gas, we want you to know exactly what to do to keep you and your family safe. Having an emergency plan is the best way to stay safe. Start your plan by locating your gas shutoff valve and learning how to turn off your gas.